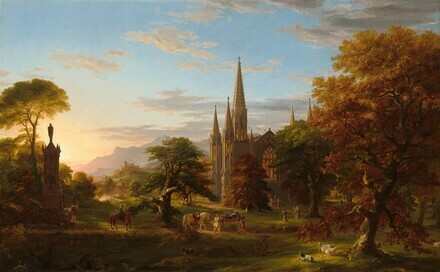 In the mid-19th century, pure landscape pictures were traditionally ranked lower than other subject matter, such as themes from history, mythology, literature, or religion. Thomas Cole sought to create what he called a “higher style of landscape” that blended narrative elements into carefully executed scenes from nature. His use of two canvases allowed him to build his narrative to even greater technical and emotional heights. The Departure introduces a troop of knights embarking on a heroic crusade in the early summer led by their lord on his valiant white horse. In The Return, a smaller group—weary and defeated—trudges home in the autumn dusk; they carry the dying lord, his riderless horse trailing behind. These pictures represent Morning and Evening, or Sunrise and Sunset; and are, merely from that point of view, invaluable. They contrast the glowing warmth of one, with the cool tints and broad shadows of the other; and to do this is the work of a master, who has studied nature and loves her….Not only this is done, but a story is told by the poet-painter, elucidating at once, the times of chivalry and feudal barbarism, and the feelings with which man rushes forth in the morning of day and of life, and the slow and funereal movements which attend the setting of his sun. Commissioned by William P. Van Rensselaer, Esq., Albany. Purchased by 1853 by William Wilson Corcoran [1798-1888], Washington; gift 10 May 1869 to the Corcoran Gallery of Art, Washington; acquired 2014 by the National Gallery of Art. Thirteenth Annual Exhibition, National Academy of Design, New York, 1838, no. 65, as The Return, Scenes Illustrative of Feudal Manners and Times. Exhibition of the Paintings of the Late Thomas Cole, American Art Union, New York, 1848, no. 57. De Gustibus: An Exhibition of American Paintings Illustrating a Century of Taste and Criticism, Corcoran Gallery of Art, Washington, 1949, no. 4. The Romantic Vision in America, Dallas Museum of Fine Arts, 1971, no. 10. American Paradise: The World of the Hudson River School, The Metropolitan Museum of Art, New York, 1987-1988, unnumbered catalogue, repro. The Century Club Collection, Corcoran Gallery of Art, Washington, D.C., 21 July - 13 September 1993, unpublished checklist. Thomas Cole: Landscape into History, National Museum of American Art, Washington; Wadsworth Atheneum, Hartford; New-Your Historical Society, New York, 1994-1995, unnumbered catalogue. Encouraging American Genius: Master Paintings from the Corcoran Gallery of Art, Corcoran Gallery of Art, Washington; Museum of Fine Arts, Houston; Parrish Art Museum, Southampton; Mint Museum of Art, Charlotte; John and Mable Ringling Museum of Art, Sarasota, 2005-2007, checklist no.16. Macleod, William. Catalogue of the Paintings, Statuary, Casts, Bronzes, &c. of the Corcoran Gallery of Art. Washington, 1882: 42, no. 3. Macleod, William. Catalogue of the Paintings, Statuary, Casts, Bronzes, &c. of the Corcoran Gallery of Art. Washington, 1887: 43, no. 3. Corcoran Gallery of Art. Handbook of the American Paintings in the Collection of the Corcoran Gallery of Art. Washington, 1947: 29. Kelly, Franklin. "Thomas Cole, The Departure, The Return." In Corcoran Gallery of Art : American Paintings to 1945. Edited by Sarah Cash. Washington, 2011: 20, 78-81, 258, repros.